Our newest members, to whom we extend our warmest welcome. 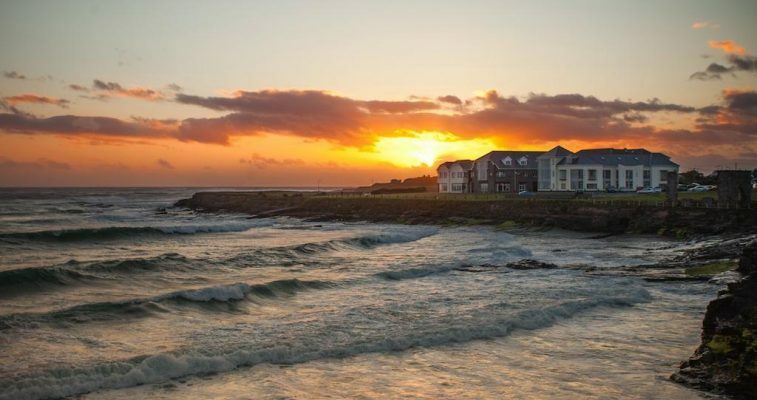 Whether you attended the recent Gathering in Spanish Point, Co Clare or not, you will no doubt enjoy reading the personal review and pictures graciously provided by Ray T. Kelly who now lives in Florida. Our condolences to long-time member and Past Uachtaran and Tanaiste, Joe A Kelly, on the death of his sister, Nancy (Sr. Antoinette Kelly.) He has shared her eulogy with us. She sounds like someone we would have enjoyed knowing in our Kelly Clan Gatherings. She was definitely a member in spirit. There is also a picture of many of Joe’s family members. Joe’s nephew, Ray Kelly (mentioned above) appears there, also. Both Mary and I have spoken with Michael Healy, a genealogist specializing in Irish ancestry, and a tour guide/reunion organizer, with Kellys in his family tree (his great-grandmother was Barbara Kelly from Co. Mayo.) He has projects planned which might be of interest to many of you, especially if you have links to County Mayo, Kerry or Cork. You will have noticed we have a new editor for our newsletters. As the retiring editor I felt it was time we had some “new blood” doing the job and was delighted when Judy Kelly Fausch agreed to take it on. Judy has always been an excellent ambassador for the Kelly Clan. I first met her in Spanish Point, Co Clare at the Kelly Clan Gathering in 2001. It was a friendship that started immediately and one of those ones with the feeling that you have known that person forever! Despite the distance between us – Judy lives in Iowa and me in Co Clare – our friendship has flourished and grown over the years and even if we don’t speak for a couple of weeks or more, it was like we spoke yesterday. Judy has always been more than willing to help and assist in any way she can to further the development of the Clan and long may this continue. I hope that you, our dear readers, will be able to support Judy and send anything of interest to her for inclusion in the newsletters. Sometimes I used to sit at the computer and stare at it, looking for inspiration to start a newsletter, but then someone would send a little snippet in and off I would go from there. As I have said many times before “it is your newsletter” and we love to hear from you with any anecdotes, newsy items, historical pieces, DNA reports, etc. etc. Our President, Mary Kelly, has been very adroitly writing, soliciting articles for and assembling the newsletter for quite some time, as well as performing her many other duties. I speak for many when I extend a big THANK YOU to Mary for a job well done. You’ve earned a break. The first Kelly Clan Gathering in 1995 at the Abbey Hotel in Roscommon Town, Co. Roscommon, was my introduction to this group. 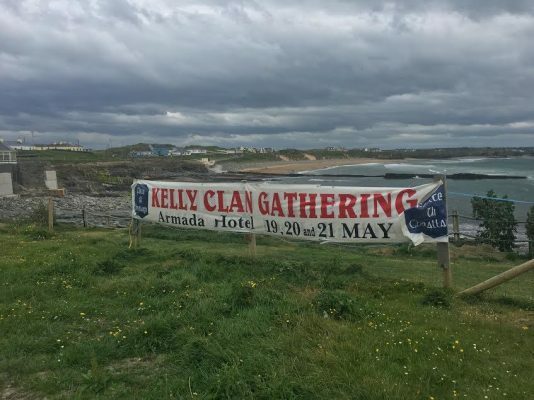 Traveling from my home in Central Iowa, USA, I have attended many Gatherings since then and have been on the Kelly Clan Council for a number of years. Many of you realize what a wealth of knowledge we have within our membership. I’m counting on the input of many people to help me produce a newsletter that will continue to be interesting, informative, and a way for us to stay in touch. Failte Ui Ceallaigh (the O’Kelly Welcome) to all of you. We hope to see you often in the future. Back row, L to R;- My Brother Pat, RIP. Brother in law, John Theodorson, RIP. Nephew, John Theodorson, Yours Truly (Joe A). My brother, Tom, RIP. Next row, on his own, Son Liam, RIP. Then, from L- R;- First wife, Nancy, RIP. On her knee,son Sean. Niece, Carmel. Tom’s first wife, Frances,RIP. In her arms, nephew,David. Son Pat. Sister, Nancy (Sr Antoinette) RIP. Sister,Susan Theodorson, RIP. Son Brian. Nephew, Raymond T.Kelly, In Front, daughter Bridget. It is with thanksgiving and a tinge of sadness that we gather to remember and honour our much loved Sister Antoinette Kelly. For those of us who have lived in the Subiaco for many years, Antoinette is a “new-comer.” She joined this community over 7 year ago when she said farewell to her Kimberley Community – where she spent more than 50 years. We have come to know Antoinette as a kind, gentle and prayerful Sister, with bright eyes and a ready smile. She had a welcome for all, eager to share stories of past and present days. Antoinette was generous in giving and gracious in receiving, and had a special love and appreciation for the nurses and carers who attended to her every need. She had a special welcome for Kimberley Sisters and people from Derby and Broome. They were her “soul friends,” the people she worked with through the heat of the day and the humidity of the tropical nights – where for many years there were few comforts. The people of the Kimberley came to know her as friend, companion, nurse and midwife. Here she spent her ministry life caring for the sick, the elderly, mothers and babies, those with leprosy and those with infectious diseases. the St John of God Congregation on 25 May 1946 and was professed on 18 Dec 1948. A few months later with her companions, she set sail for Australia where she began her nurse training at St John of God Hospital, Subiaco (Perth). She made final profession on 18 Dec 1951. After a short time in Geraldton, Antoinette volunteered for the Kimberley mission. She arrived in Broome on 21 June 1956 with Sr Remedius Murphy. Witnessing the tragedy of Remedius’ accidental drowning on the edge of Broome Beach, in March 1958, was a painful memory she rarely shared. Her first ministry in the Kimberley was to the isolated mission of Beagle Bay, where she was the only nurse. She attended to every “emergency.” The nearest doctor, in Broome, visited every six weeks, and he was a full day’s journey away – along a dirt track in the 1950s. Antoinette became friends with the Aboriginal people and had great regard for their simplicity of life and survival skills. May Howard became a special friend – whom Antoinette could rely on, as she was the accepted local “baby deliverer!” They remained lifelong friends. In the early 1960’s Antoinette was appointed to the Native Hospital in Derby. “This Hospital was poorly equipped, run-down buildings, little medicine – and trucks that pulled up loaded with sick people, mothers with dying babies from far-away stations”, is how it was described. The Sisters coped as best they could. There were no fans, no airconditioners to counter the soaring summer heat under a low tin roof. It was here that Antoinette came to understand and appreciate the Aboriginal culture and their way of life. In 1966 Antoinette was among the group of six John of God Nursing Sisters who moved with 90 Aboriginal patients, from the “old Native Hospital” in Derby to the Government Hospital. It was a historic moment, as it was the first time in the Kimberley to combine Aboriginal and non-Aboriginal patients in the same hospital. In her role as Nurse-inCharge of Maternity, Antoinette combined her professional skills with her kind and gentle personality, attending to all without distinction of race, colour or creed. Antoinette was appointed Regional Leader in the Kimberley in the early 1970s, a role she carried with kindness, but never “fell in love with the role.” As Regional Leader she moved to the Leprosarium where she took her turn in nursing duties – in a challenging environment – remembering that the minimum stay for patients at the Leprosarium was at least 8 years. 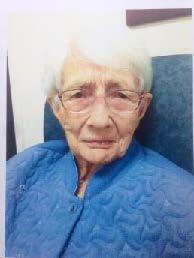 She remained at the leprosarium until it closed in 1986. Infectious Disease Unit – where she worked closely with Sr Francis Dunne and Dr Randy Spargo and the team of Community Health Nurses. In conclusion, it suffices to say that the Sisters of St John of God and the people of the Kimberley have been greatly enriched by the life-long contribution of the gentle and prayerful Sr Antoinette Kelly. May we be encouraged by the example of her life, and the God-spirit she shared with us. May you rest in peace, Antoinette. Joe’s comments about his sister: “Nancy and I were always very close. She was a wonderful sister, very understanding and helpful with a great modest sense of humour. Ireland RnR Tours company is a veteran owned business based in the USA. Tour organizers and hosts are Mike Healy and his wife, Victoria Christie-Healy. Mike Healy is a USMA West Point and Trinity College, Dublin, Ireland graduate with a deep love and appreciation of all that Ireland has to offer to the tourist. In addition to his passion for Ireland travel, Mike is a professional genealogist, specializing in helping people around the world find their Irish ancestors’ origins and birthplaces in Ireland back to 1840. In providing his Irish genealogy services, Mike’s ultimate goals are to find, retrieve, and deliver to his clients their Irish ancestors’ official Irish church baptism certificates and Irish government birth certificates. Mike developed his interest and passion for Irish genealogy through the study of his own Irish family history, (Mike’s great-grandmother was Barbara Kelly from Co. Mayo) stimulated by lengthy Healy family history conversations and discussions with his relatives in Ireland. Mike’s Ireland RnR Tours YouTube Channel, www.YouTube.com/IrelandRnRToursChannel, , has over 200 short videos shot in Ireland for viewers to preview all that we do in Ireland on our tours. Victoria Christie-Healy has been knitting since childhood with long breaks taken for schooling, family raising and careers. She has been devoting herself to this obsession for knitting most seriously for the past dozen years or so. In recent years Victoria has been a member of the Loudoun Valley Sheep Producer’s Association, giving time and attention to their Wool Shop. This has been a wonderful way to learn about breed specific artisan wool yarns that are available through local sheep farms. Her career as a knitting teacher started at the Reston Community Center in 2009. She has taught beginning and intermediate knitting classes for the Reston, Herndon and Vienna community Centers. Most knitters eventually do some charity work, and Victoria is no exception. She donated some of her teaching time to be auctioned off by the Reston Interfaith organization.